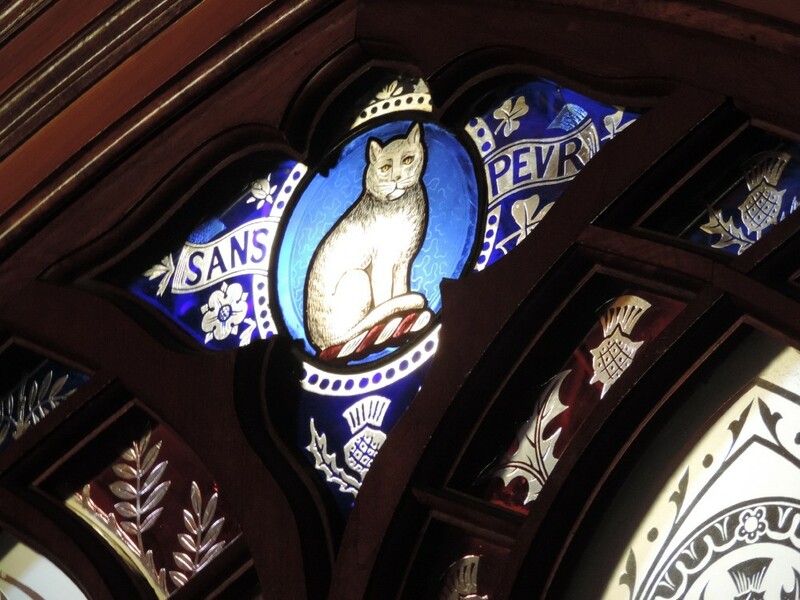 THIS is the second of my two posts about the most southerly of New Zealand’s four main historic port cities, namely, Dunedin. The first one is here. 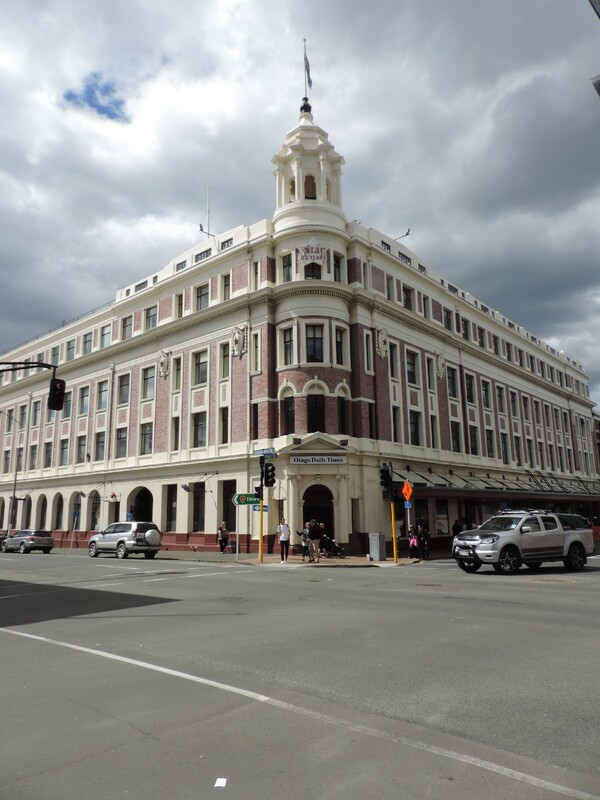 To the extent that Dunedin’s been heard of outside New Zealand, it’s probably best known for the ‘Dunedin Sound’, that for a time re-defined the city as a South Pacific Seattle. 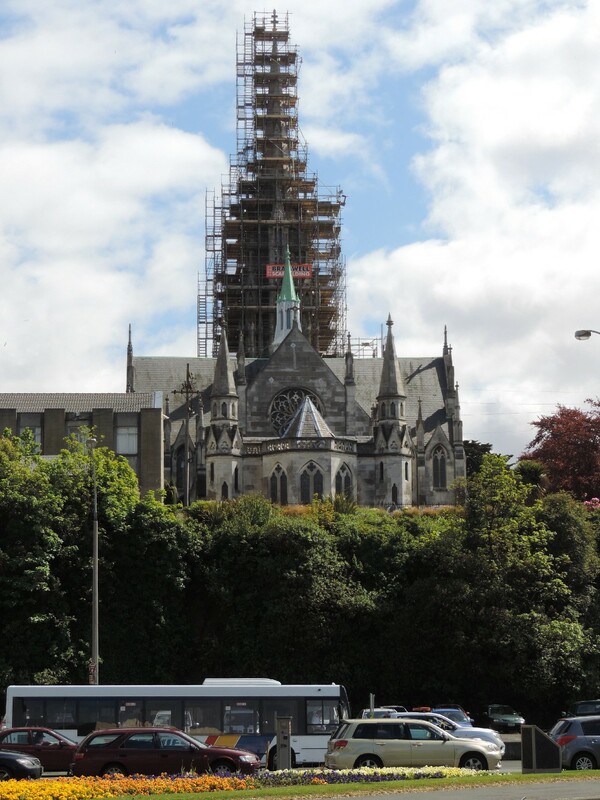 Though Dunedin’s not very big by modern standards — with a population just topping 130,000 — it was the most important city in late-nineteenth century New Zealand, and still carries an air of cultural gravitas that isn’t to be found in some cities that are a lot bigger. Dunedin’s talents have been literary too. 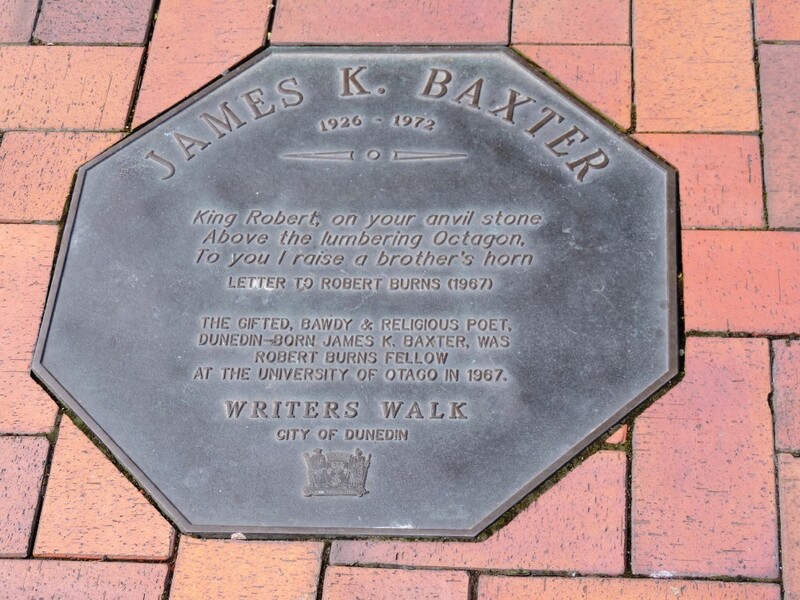 The internationally renowned poet James K. Baxter was a Dunedinite, among others. The existence of all this urban talent is all the more remarkable, given that the usual image of New Zealand is a rural one focused on cows and scenery and hard men with leather (rugby) balls: an image that official New Zealand does nothing to correct. Otago University, named after the wider region of Otago in which Dunedin is the largest city, also produced the first woman Bachelor of Arts graduate in the British Empire, Kate Edger (1877), and New Zealand’s first female lawyer, Ethel Benjamin (1898). The first Māori medical graduate, Te Rangi Hiroa (Peter Buck) also received his initial medical degree and subsequent MD from Otago University, where one of the student residences is now named after him. 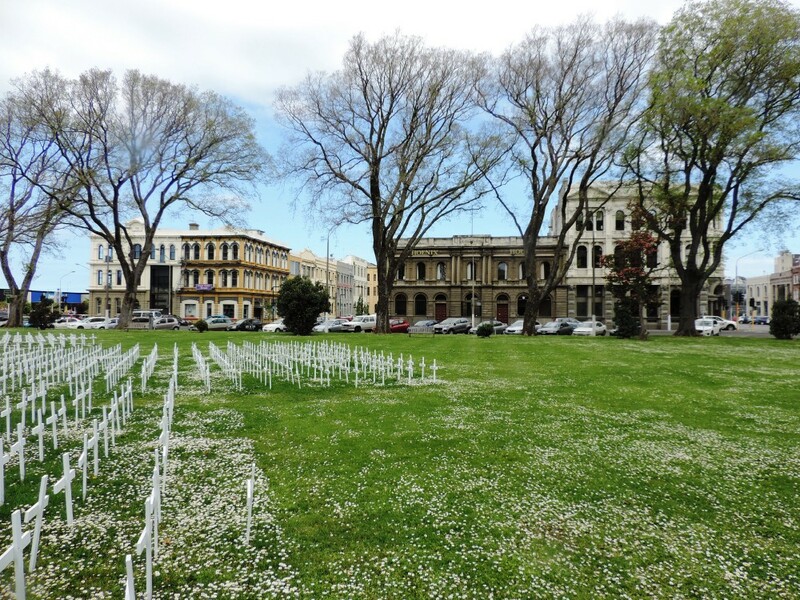 Perhaps a degree of cultural surplus over and above what might be thought necessary to operate an economy based on cows, scenery and sport has something to do with the fact that cities like Dunedin and Christchurch were founded on a certain idealistic principle. They were both, originally, church settlements, the one Anglican, the other Presbyterian. 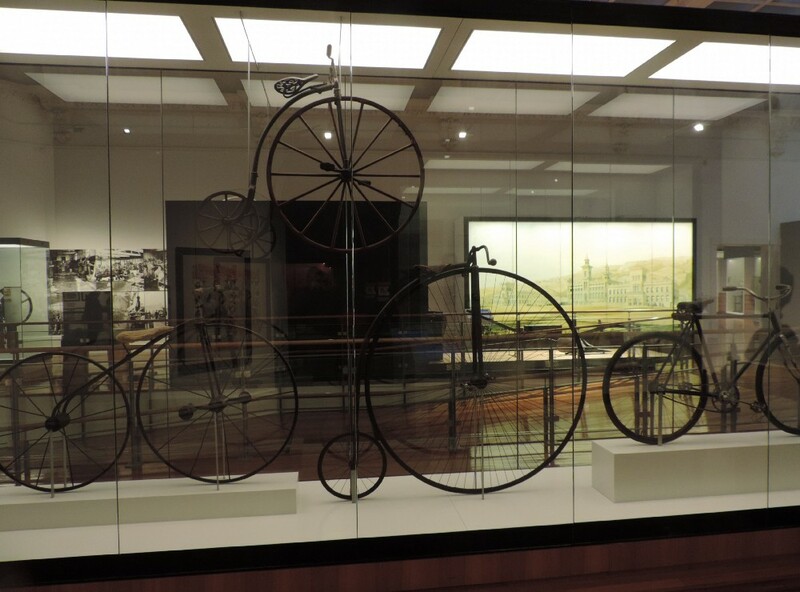 Display in the Toitū Otago Settlers Museum. 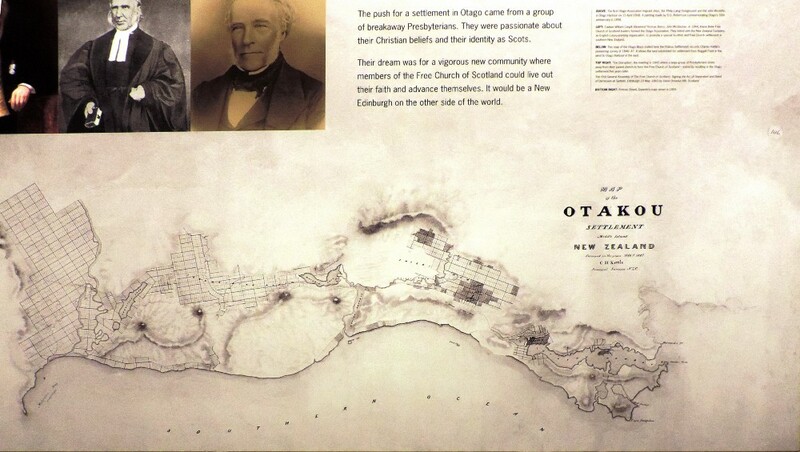 It is interesting that the old map gives the more correct or standard name for the Otago region, that is to say Ōtākou in the latest spelling. 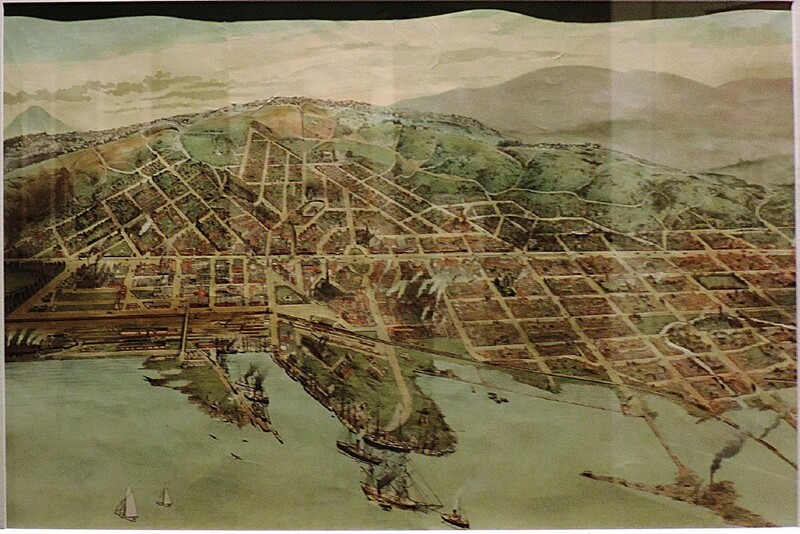 Bird’s Eye View of Dunedin (1898), drawn by Robert Hawcridge, printed by J. Wilkie & co. and published by W.J. 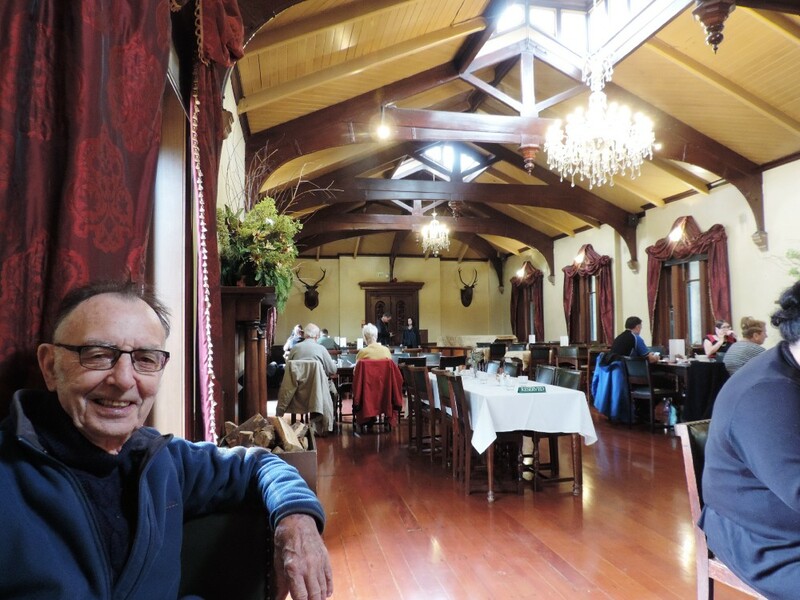 Prictor to celebrate the 50th anniversary of the founding of Dunedin. 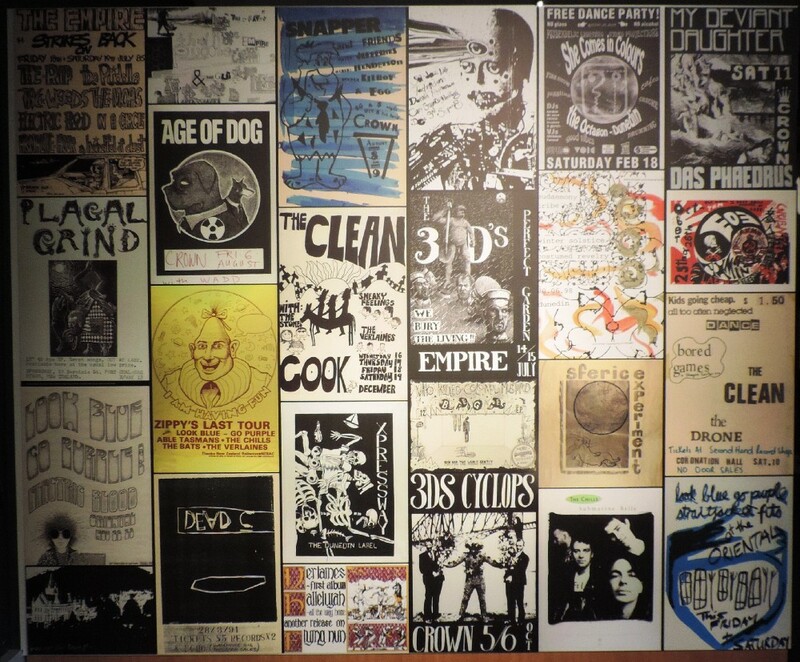 Photographed on the wall at the Toitū Otago Settlers Museum. Even the statue of Robert Burns in the Octagon is no sentimental gesture. 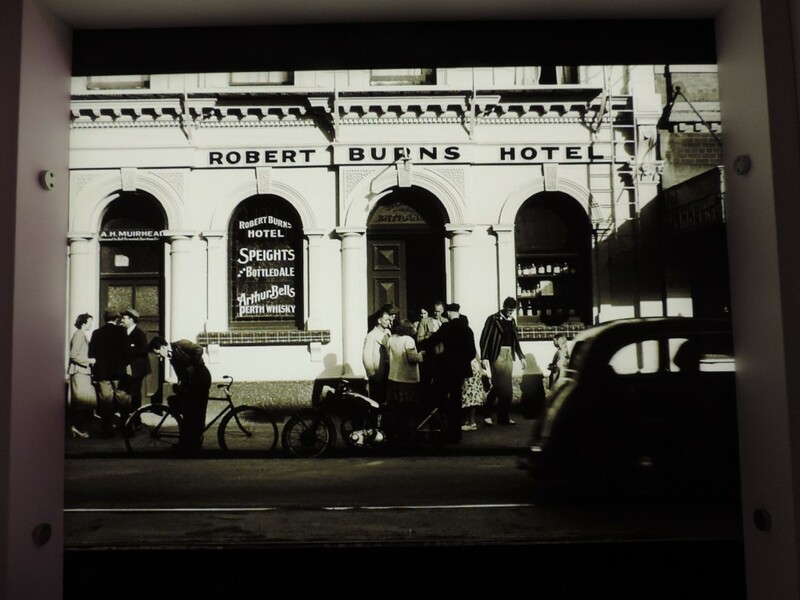 One of the founders of Dunedin was the Reverend Thomas Burns, a nephew of the radical Scots poet and humanitarian: whom Dunedin also commemorates by way of another venerable institution. 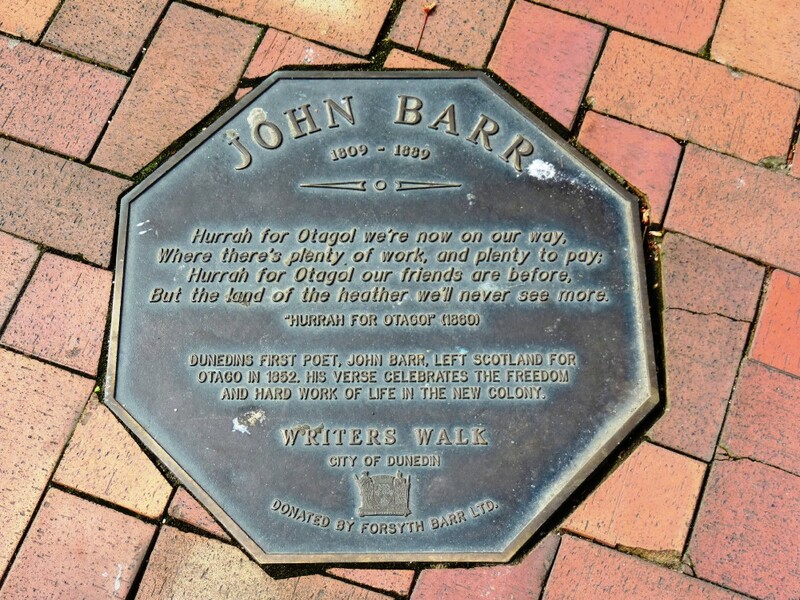 The colonial city’s balladeer, John Barr, blended high hopes with a similarly radical edge to Burns. 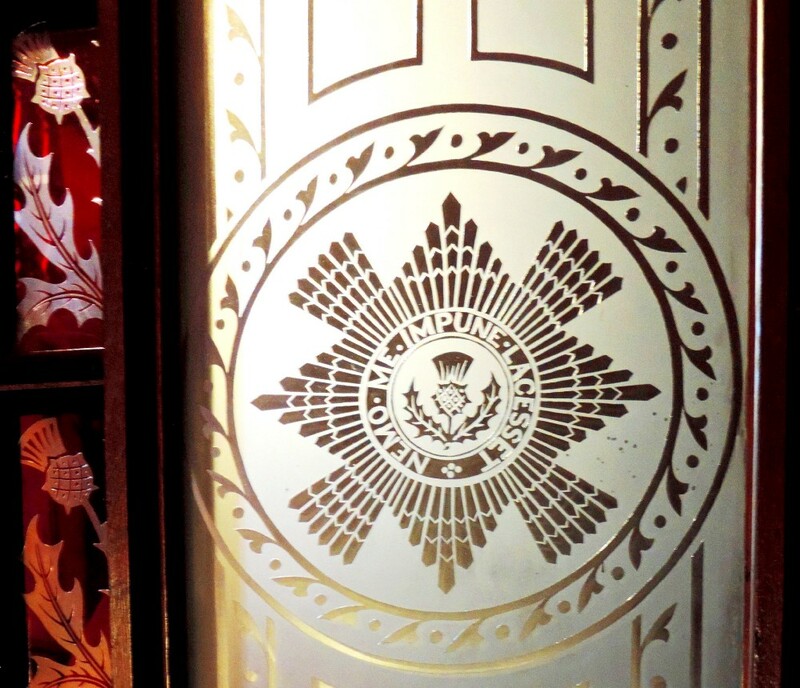 If Dunedin was to be a New Edinburgh (the name Chambers managed to have dropped) it was, at the same time to be a renewed Edinburgh. That money makes the man. The twin bounties that really put Dunedin on the map, and eased its incipient poverty, were first sheep, then gold. Arid plains and hills suited the valuable merino, which finds the rest of New Zealand too damp for its thick fleece and delicate feet. 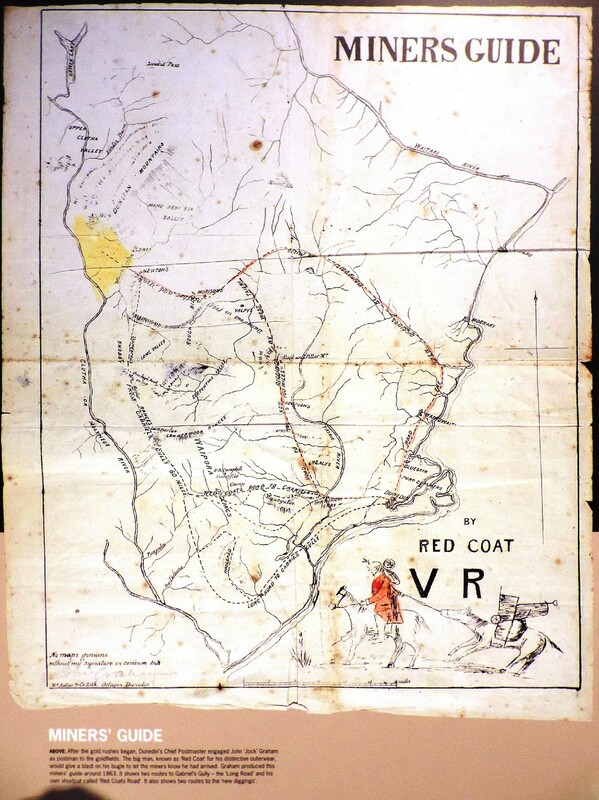 And then there was gold, officially discovered in 1861 by Gabriel Read at ‘Gabriel’s Gully’ and soon found at other sites in Otago as well, such as the Shotover River outside a newly-founded Queenstown, lately mapped by explorers such as the surveyor and watercolourist John Turnbull Thomson. According to a display in the Otago Museum, Thomson named some 200 natural features in Otago, such as as Mount Aspiring (“a glorious pyramid of ice and snow”) and the Remarkables, the cheese-grater mountains that stand so alarmingly close to Queenstown Airport. 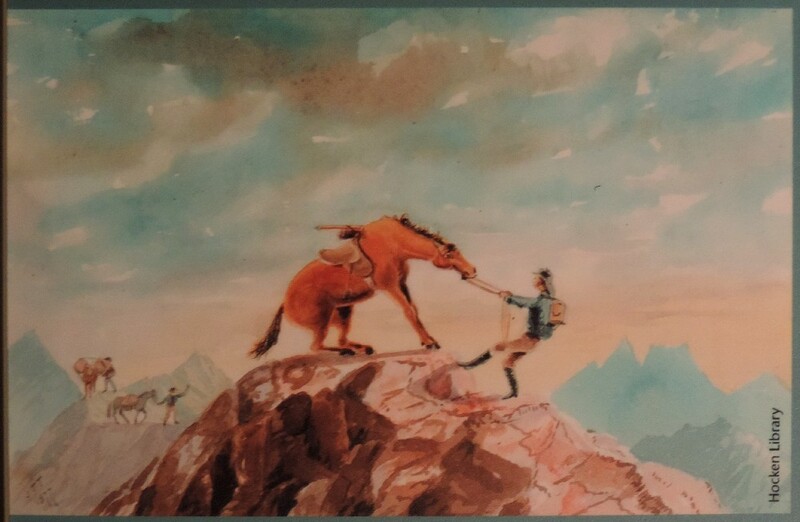 In this watercolour, executed sometime in the 1850s, it looks like Thomson’s horse has had enough of all that. The Māori knew about all these places, of course. 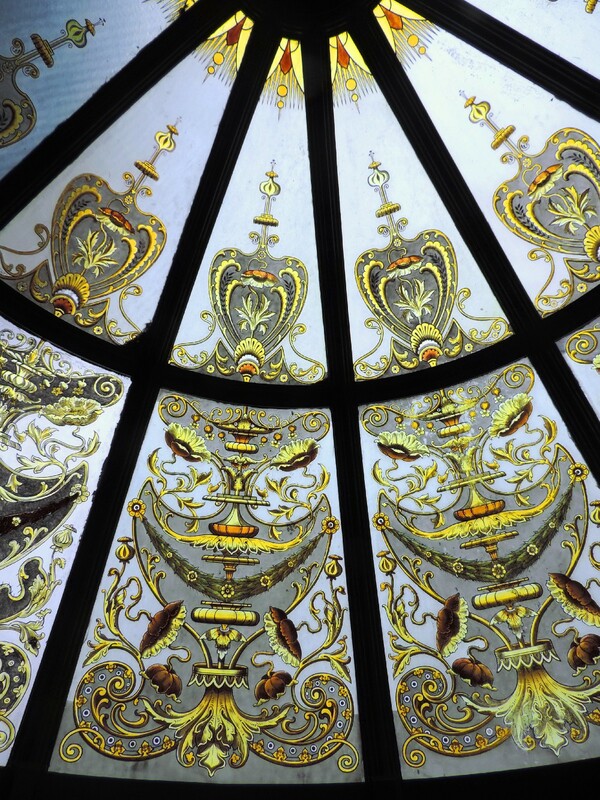 But Thomson was the first to create accurately surveyed maps of the interior, just in time for the gold rush. His discovery did not enrich himself, but it was instrumental in leading to great results through the medium of Gabriel Read’s more stimulating experiences. 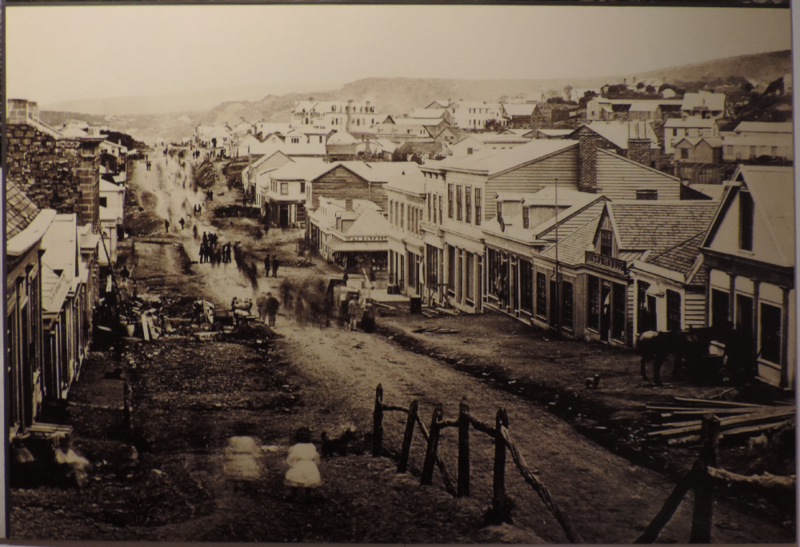 In 1861, Peter, through Mr. John Foster, of Kaihiku Falls, laid his claim before the Provincial Government, for the reward offered for the discovery of the goldfield, but the application was refused, and it was not till 1885 that any public recognition of his services was made. Then £50 was placed in the Appropriation Act by the Government for his benefit; conditionally on the public raising a like amount. The public did not resent this niggardly stipulation, and raised the necessary sum. This small sum was judiciously invested, and in that way “Black Peter,” in his declining years, was freed from absolute want. So much for being first. 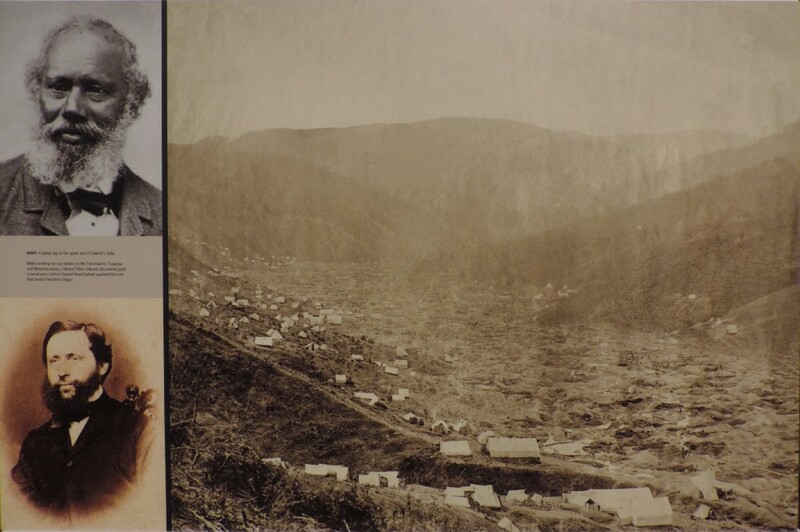 For, the Otago Goldfields would soon be found to be of world-class proportions, in ways that would make the sleepy religious settlement of Dunedin into their San Francisco and, obviously, never quite so religious again. My editor Chris visited Gabriel’s Gully on the way to Dunedin with my father. There’s nothing much to be seen in Gabriel’s Gully now; it’s long since reverted to sheep. As the song Lorena, popular at the time, has it, the years sleep on. 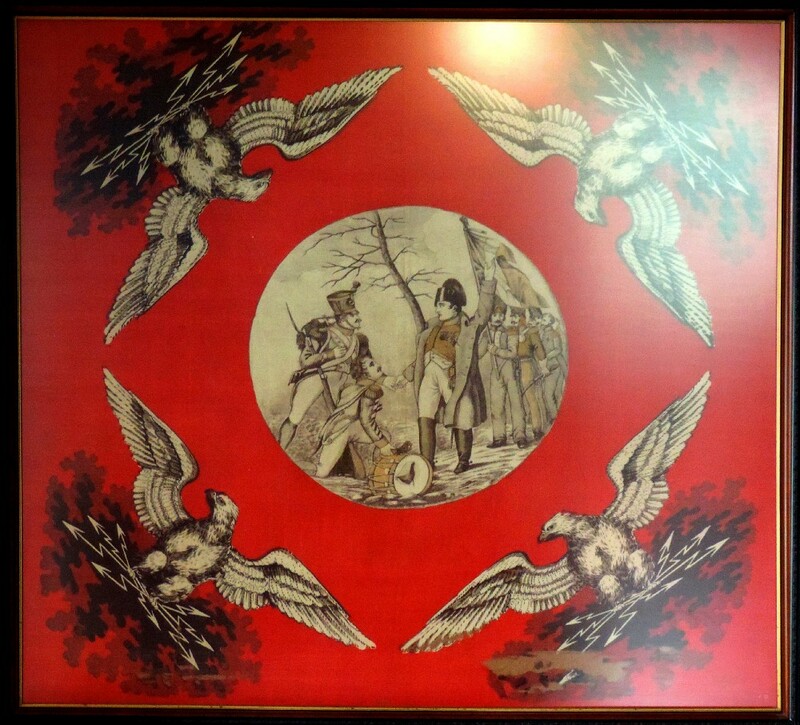 Others who missed out on the wealth of the interior included the South Island Māori, who were few in number and weakened further by recent invasions from the more numerous Māori of North Island, when European colonisation of the South Island began in earnest in the 1840s. When Māori first arrived in New Zealand, a little under a thousand years ago, the South Island was quite well-wooded, though the forests in the drier parts of the island were balanced on an ecological knife-edge, in a similar fashion to the now-vanished forests of Easter Island or Rapa Nui, which is also quite arid. 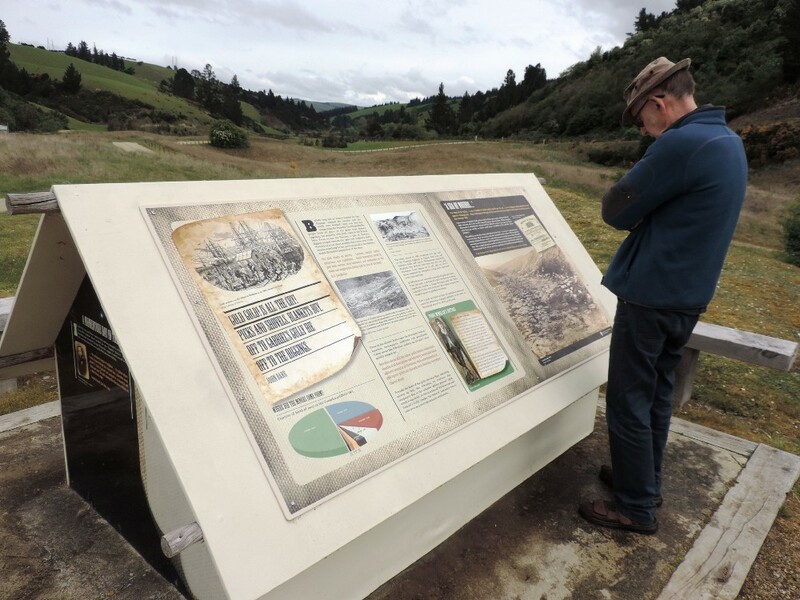 Used to setting fires which remained under control in damper climates, the early Māori colonists of the South Island soon deforested much of the island through fires that got out of hand. These are still remembered as the ‘fires of Tamātea’, an ancestor-figure who burnt down vast areas of now-vanished forest. In modern times, the legend of the fires of Tamātea came to be regarded as a supernatural account of how the barren and treeless landscapes so typical of the South Island came to be created. Then, with the aid of detailed scientific investigations, moderns came to realise that the legend of the fires of Tamātea was actually true,or as near to the truth as makes little difference. The extinction of the giant birds now called the moa, and the giant forest eagle that preyed on them, is linked to the fires of Tamātea; which scientists now study intently for lessons that might be learned regarding the impacts of future climate change and the possible loss of other fragile forests such as those of the Amazon. With the desertification of much of Otago and the province of Canterbury to its north as a result of the fires of Tamātea, the numbers of South Island Māori dwindled to a few thousand, far fewer than in the North Island. 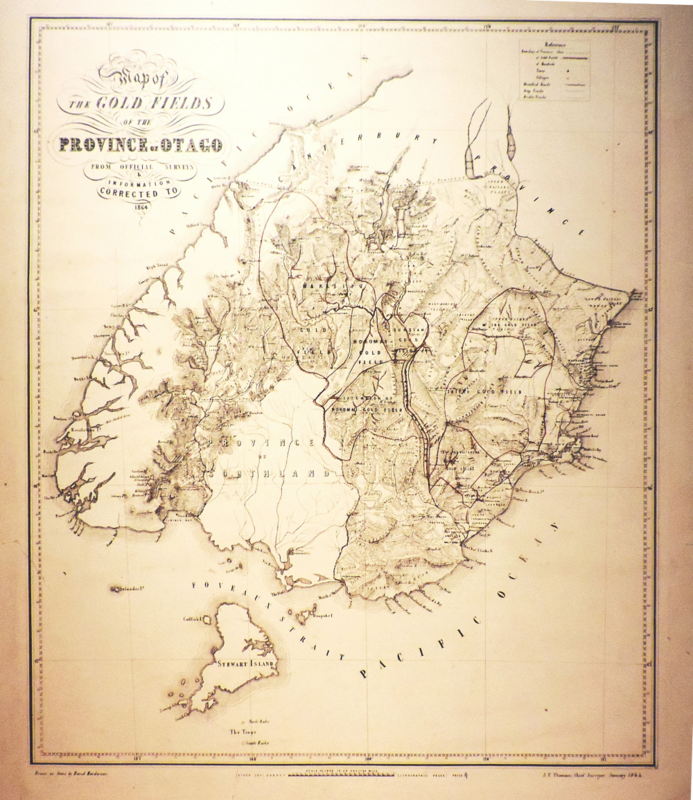 From 1844 onwards, vast areas of the South Island were then purchased by European colonists for a pittance, often corruptly and coercively, leaving only 1% of the island in Māori hands. The South Island Māori were supposed to be allocated reserves within the lands purchased, to prosper from European settlements that grew up around them (which is perhaps another reason why some Māori were willing to sell cheaply), but this seldom happened. This is one major qualification to the claim that the founders of Otago and other nineteenth-century South Island colonies always behaved in an enlightened manner. It’s probably closer to the truth that, whereas the North Island colonists were often embroiled in warfare with the more numerous North Island Māori, the South Island colonists barely noticed that the South Island Māori existed at all. Betrayed by a harsh ecology at home and invaders from the sea, South Island Māori therefore became perhaps the most dispossessed of all New Zealand’s Māori, ironically at the very instant when the South Island began to prosper once more. 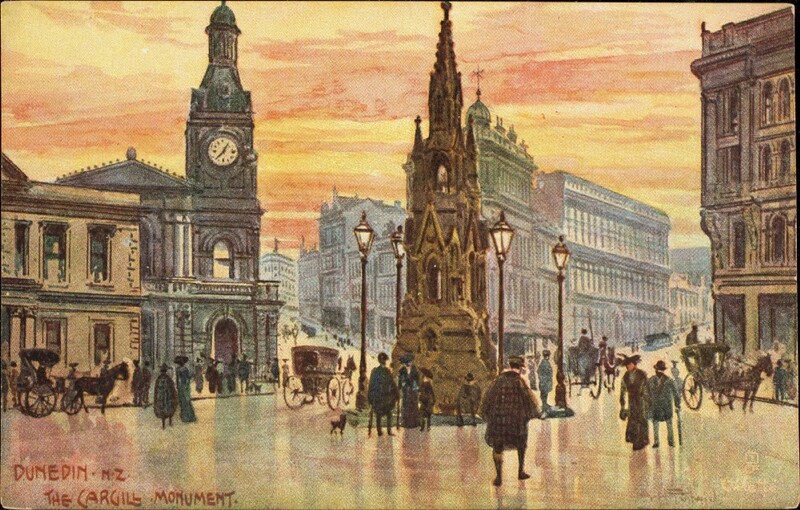 For, while it was still a bit of a frontier town in the Gold Rush era when this photo was taken . . .
. . . Dunedin would be ‘no mean city’ by the end of the 1800s, as indicated in this amazing postcard of a sunset over the Cargill Monument. Digitised postcard dated 1900 to 1909 (no 7352, in the ‘Oilette’ series), from the Leonard A. Lauder Collection of Raphael Tuck & sons postcards of the Newberry Library, Chicago, via Wikimedia Commons. Public domain image. 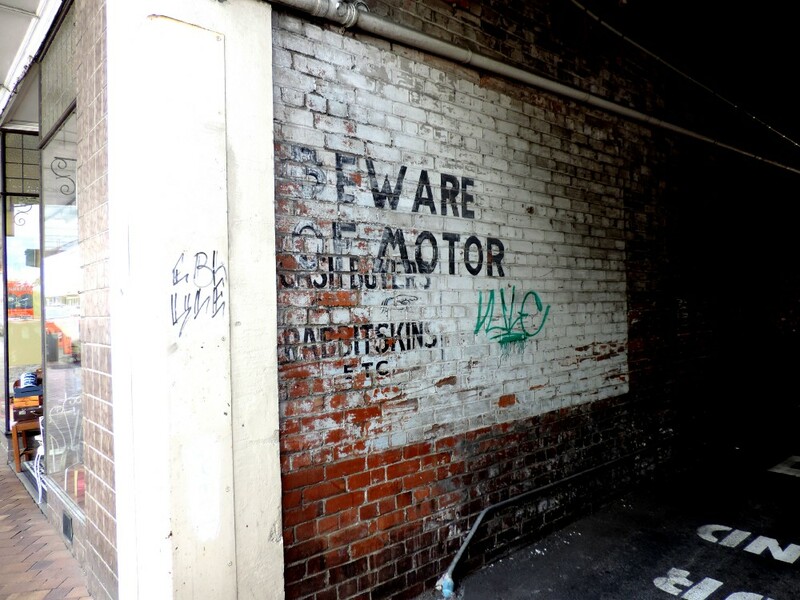 Even as it fell behind in the population race, Dunedin remained more industrially-developed than any other New Zealand city until well into the twentieth century. Away from the Octagon, the Cargill Monument and the downtown’s architectural heritage, we find industrial heritage. 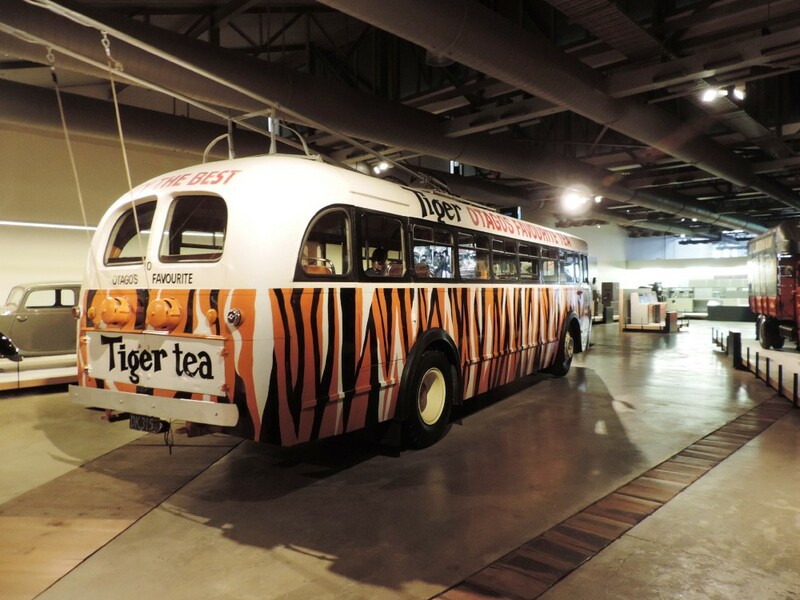 There’s a lot of industrial stuff in the Otago Museum and in the Settlers’ Museum, as well as some more quirky exhibits such as this trolleybus decked out in advertising livery of the 1950s or 1960s. 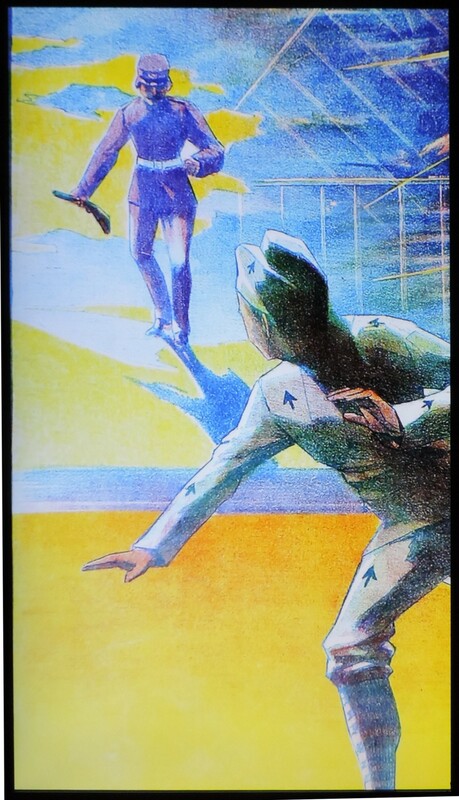 The settlers’ museum also displays some absolutely amazing posters by local artists working in Victorian times. 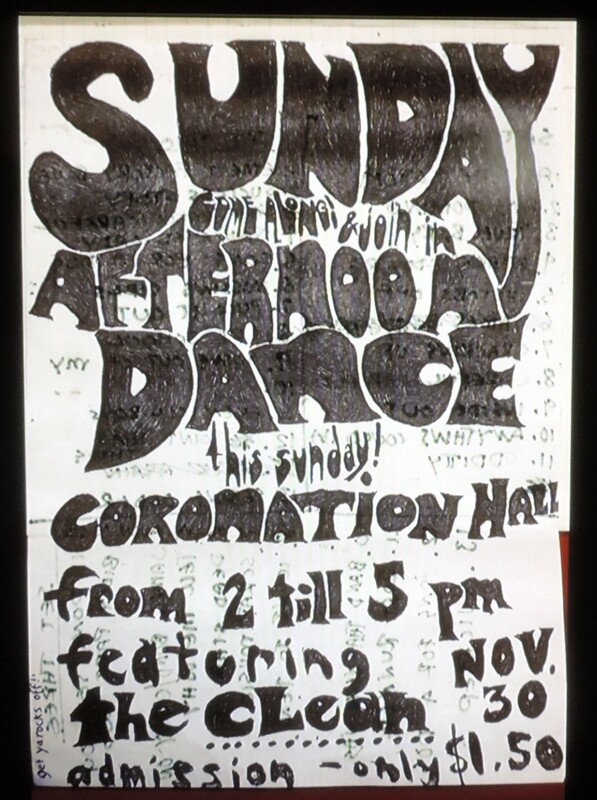 There’s clearly nothing new about the profession of graphic design! 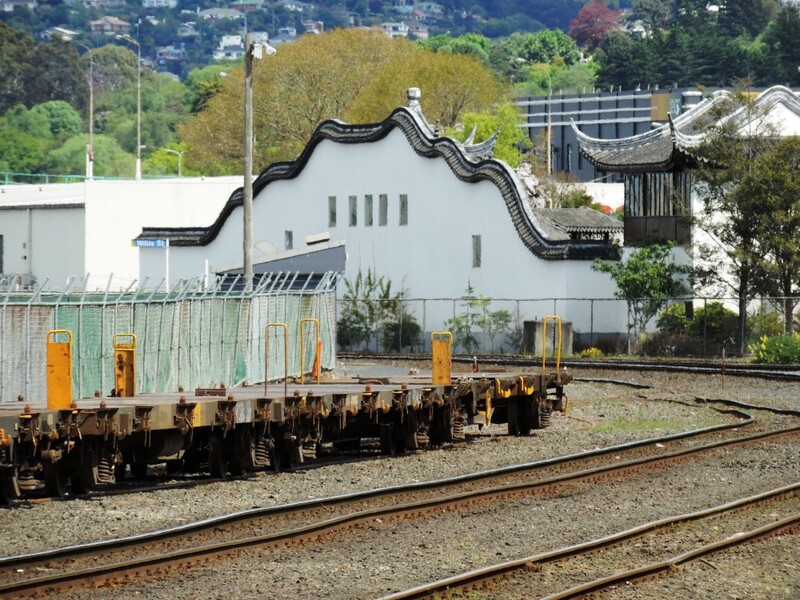 As I say in my first Dunedin post, many of the early miners were Chinese. Partly in commemoration, and perhaps partly also in atonement for the innumerable prejudices and restrictions visited on the Chinese minority and other non-European immigrants in colonial New Zealand and even into more recent times, there’s now an amazing traditional Chinese scholar’s garden on a site next to the Dunedin Railway Station, the only such garden in the Southern Hemisphere. 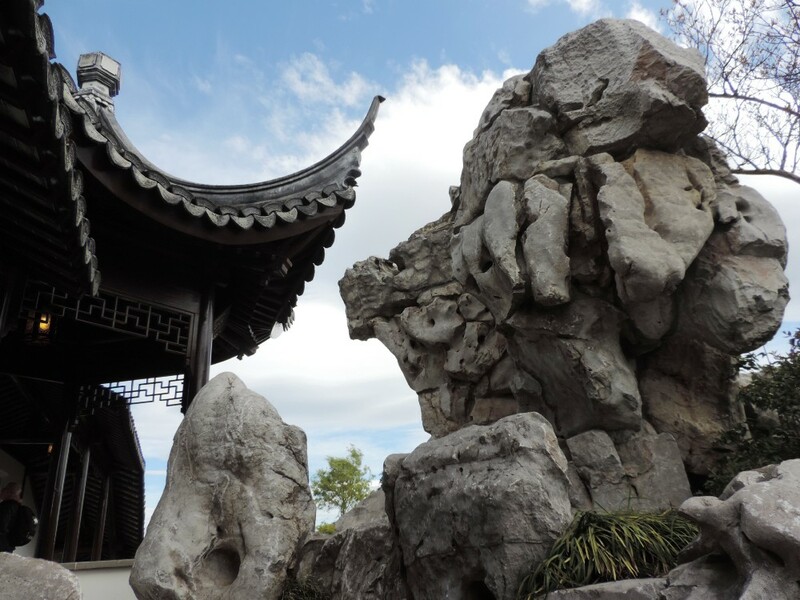 The garden was built with official help from the Chinese government, help that included the provision of skilled craft workers and the transportation of many tons of perforated and pitted limestone rocks called gongshi from Lake Tai (or Taihu), a large shallow lake west of Shanghai. Gongshi are the only form of rock deemed suitable for this type of garden. 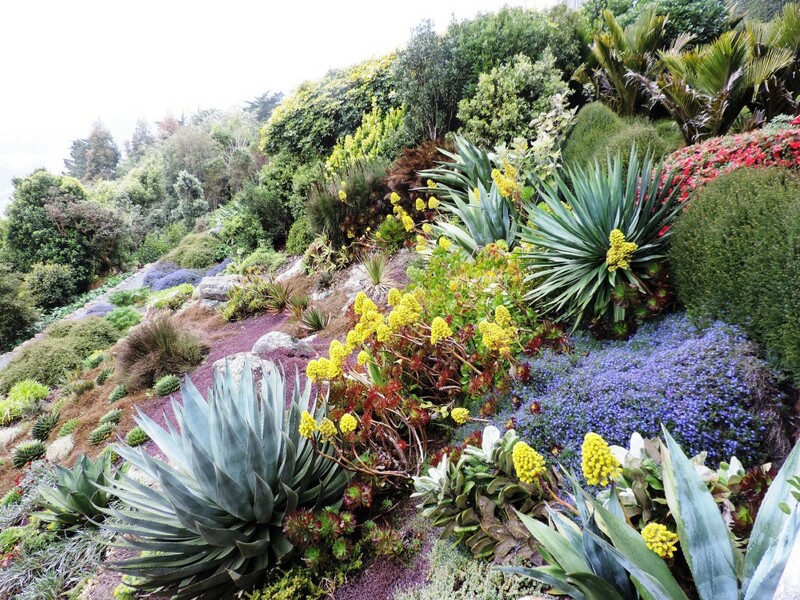 “ Most cherished in this mundane world is a place without traffic, truly in the midst of a city there can be mountain and forest.” So writes the Ming Dynasty poet Wen Zhingming, in lines quoted on the gardens’ website. In such a place, one may well contemplate how nature and time triumph over the straight lines of humanity in ways that lead to picturesque ruins and ultimate renewal of the earth: “Behold the summer grass /All that remains of the dreams of warriors,” as a Japanese poet put it, with characteristic pithiness. 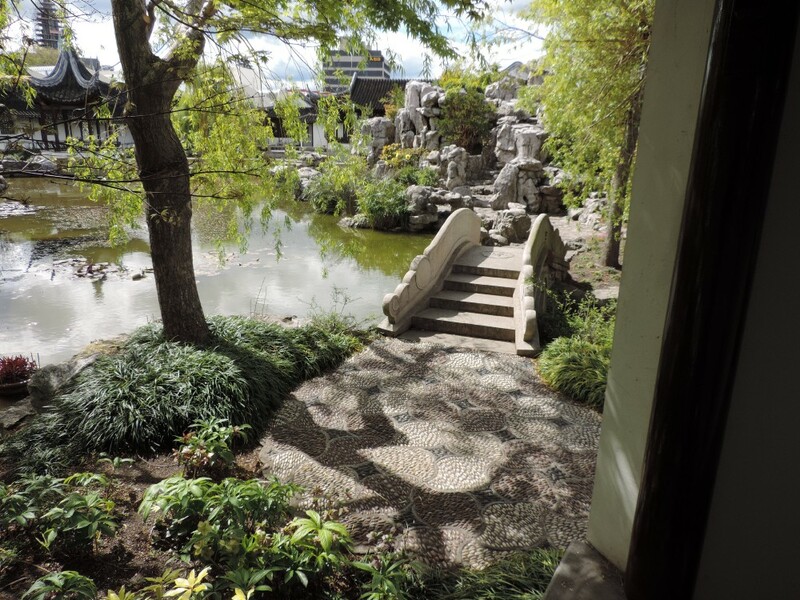 Dunedin’s Chinese garden charges a fee for this mental refreshment. However, readers on a budget will be pleased to know that a similar, if inferior, form of meditation can be performed for free by gazing at the deteriorating railway lines outside the garden‘s back wall. There’s a lot of infrastructure in New Zealand, including tourist infrastructure, that isn’t really up to scratch these days; and this is a good example. 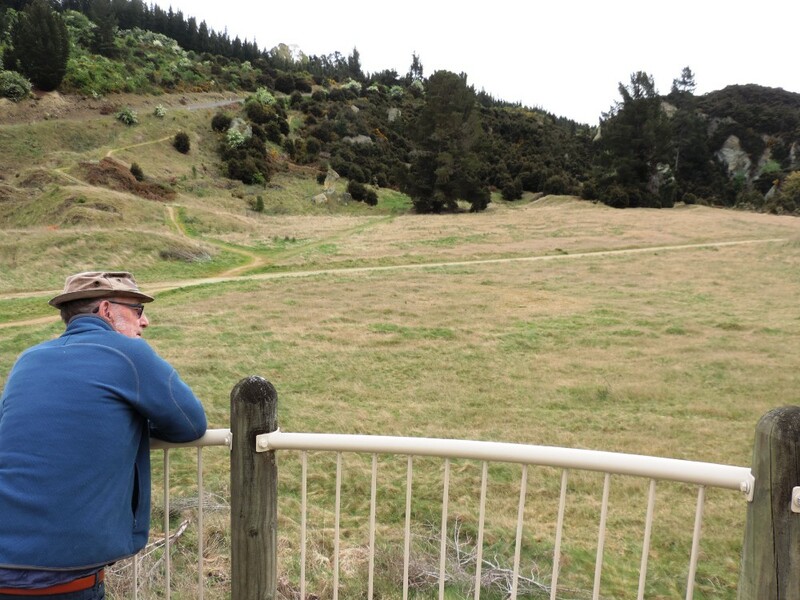 My editor recalls that this is the worst section of the Taieri Gorge Railway trip; the rest of it is a good ride. These days, Dunedin remains more European than the New Zealand population as a whole (88% European), but its population is nevertheless more than 6% Asian and almost 8% Māori. The third-largest minority, Pacific peoples, make up 2.5% of the population. 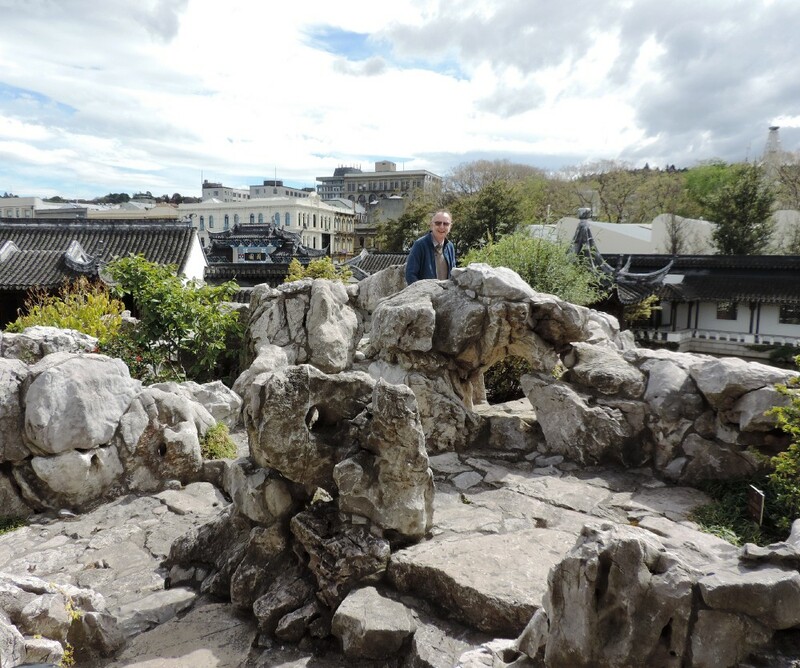 At the time of the commissioning of the Dunedin Chinese Garden, as the scholar’s garden is officially known, the Mayor of Dunedin was the ethnically-Chinese Peter Chin. Finally, dad and my editor headed out onto the Otago Peninsula, which juts out into the sea south of Dunedin and guards its harbour from the Southern Ocean. 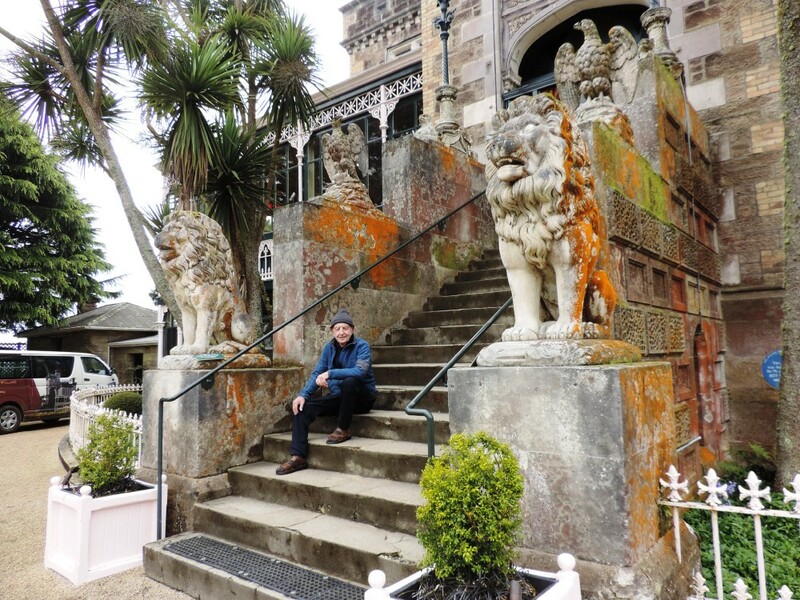 The first major attraction they visited on the peninsula was Larnach’s Castle, or more formally Larnach Castle, which is the only castle in New Zealand. 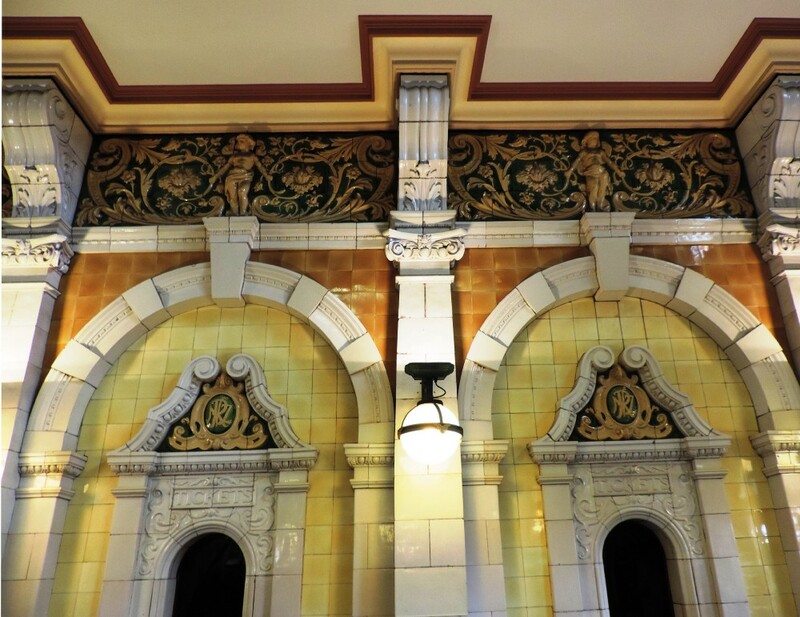 It is of course a Victorian faux replica in the spirit of Neuschwanstein, albeit more modest. 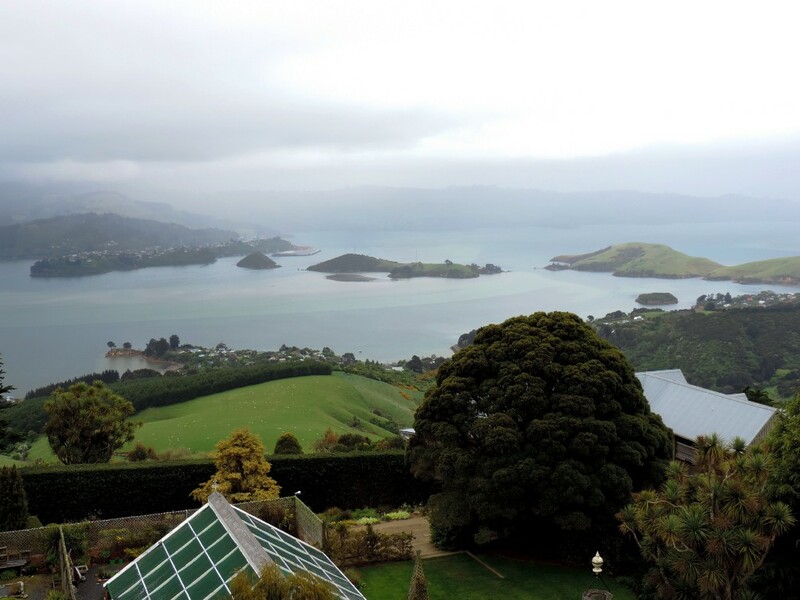 This is one thing New Zealand lacks as a tourism destination as compared to Scotland or Bavaria; that is to say, an essentially similar landscape but unfortunately no castles, with the exception of Larnach’s Castle. 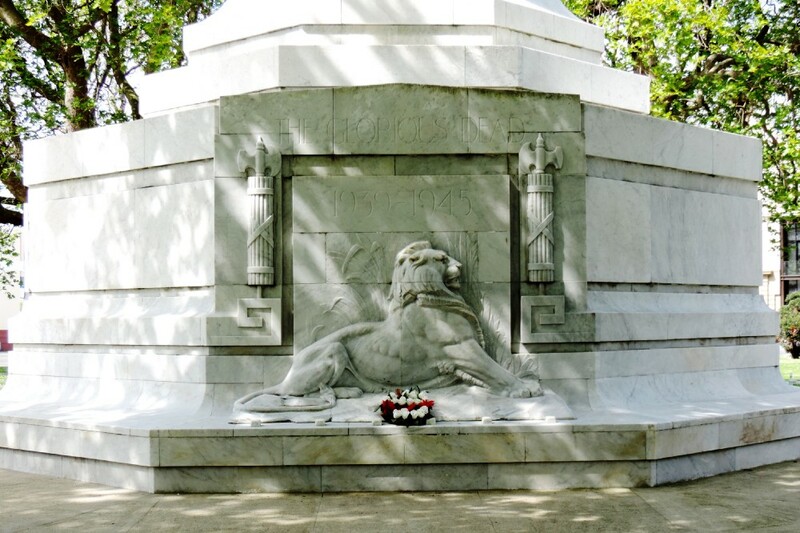 William Larnach was a nineteenth-century businessman and politician who spent a lot of money on building a castle in New Zealand in the 1870s, and then got into financial difficulties some twenty years later and shot himself in 1898. In view of the time lag, I don’t think expenditure on the castle was to blame; though there’s possibly a bit of a warning here for over-enthusiastic renovators all the same. 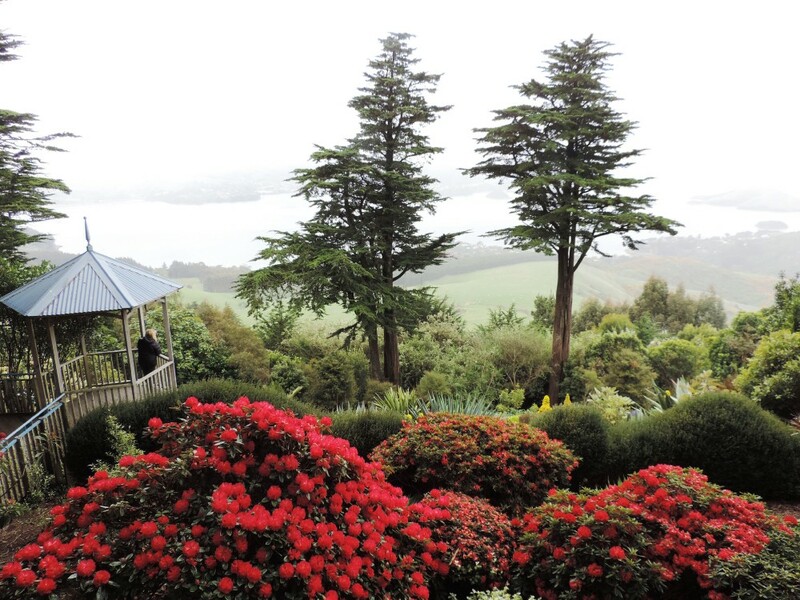 Larnach’s Castle is built on a promontory covered in gardens, which would have amazing views in good weather, though it was a bit misty when dad and Chris were there. You know you’re in Dunedin when you come across this symbol! Chris and my father then continued on to Taiaroa Head at the tip of the Otago Peninsula to visit the albatross colony there, the only Southern Hemisphere breeding site for albatrosses of any sort that isn’t on a small island. The albatross (in Māori, toroa) colony is mainly focused on the conservation of the Royal Albatross (Toroa Whakaingo), the largest seabird in the world, which only breeds in New Zealand. Strictly speaking, the biggest ones are the Southern Royal Albatross which breeds on New Zealand islands nearer to Antarctica; the ones at Taiaroa Head are the Northern Royal Albatross, slightly smaller but still huge with a three-metre (ten-foot) wingspan. Unfortunately, it wasn’t really the right time of year and they didn’t get to see a lot apart from seagulls and some educational films, but this is definitely a must-see if properly organised. Meanwhile, you can watch the RoyalCam, a popular live streaming of a Royal Albatross nest. Nesting albatrosses face a lot of dangers from pests these days. The more southerly islands, halfway between New Zealand’s mainland and Antarctica, and similar islands run by the Australians and South Africans, have become over-run by mice, escapees from ships, that basically don’t have much to eat apart from seabird chicks. 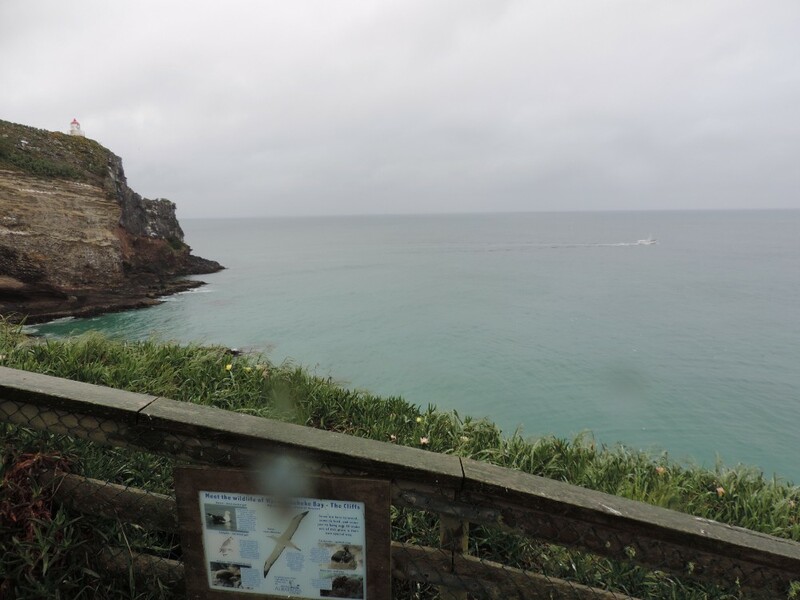 And at Taiaroa Head, which can get pretty hot in summer, the hatching chicks, which can take five days to chip their way out of the eggs, are attacked by blowflies, including the aggressive introduced Australian blowfly lucilia cuprina. Anyhow, the conservation staff at Taiaroa Head check the chicks regularly, and have sprinklers that help them to cool off. Along its length, the Otago Peninsula is also the breeding site of the Yellow-Eyed Penguin or Hoiho, a Māori name meaning ‘noise shouter’. Like the Royal Albatross, the Hoiho is also exclusive to New Zealand, and like the Northern Royal Albatross it nests on the mainland. It waddles inland up to a kilometre to nest in the shady forests that it prefers. Other wildlife include seals and the local Hector’s Dolphin. Unsurprisingly, the peninsula is a major ecotourism destination. Here’s Taiaroa Head, where there’s also a lighthouse. And that’s really the geographical end of Dunedin!